Yes, I put my chicken in raw, but the sausage is probably already cooked if it’s something like Kielbasa. I’m trying this recipe for the first time for a large group. In the second step where you say to shred the chicken directly in the crock pot, do you mean after it has cooked along with the other essential ingredients or do I keep the chicken separate/uncooked until this last stage when it will be shredded and added to the pot? Yes – after it’s cooked, right in the pot, with all the other essentials. I love hearing that! Thanks for the comment Erin! can you add peanut butter instead of almond butter?? Don’t have almond butter right now…. The crockpot is currently on! Can’t wait! 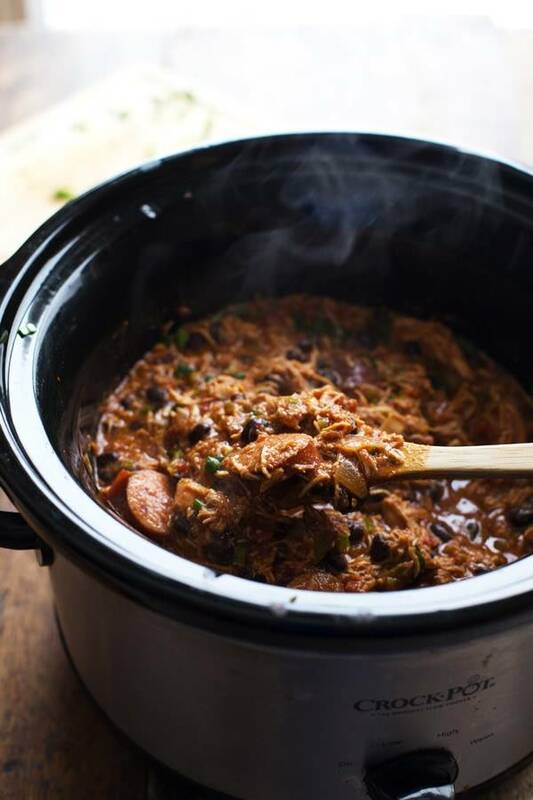 Hello – I love the look of this recipe, but was wondering if it’s possible to do without a slow-cooker, so just in a big pot and put in a low heat in the oven? What temperature would be best and would it be the same amount of time? 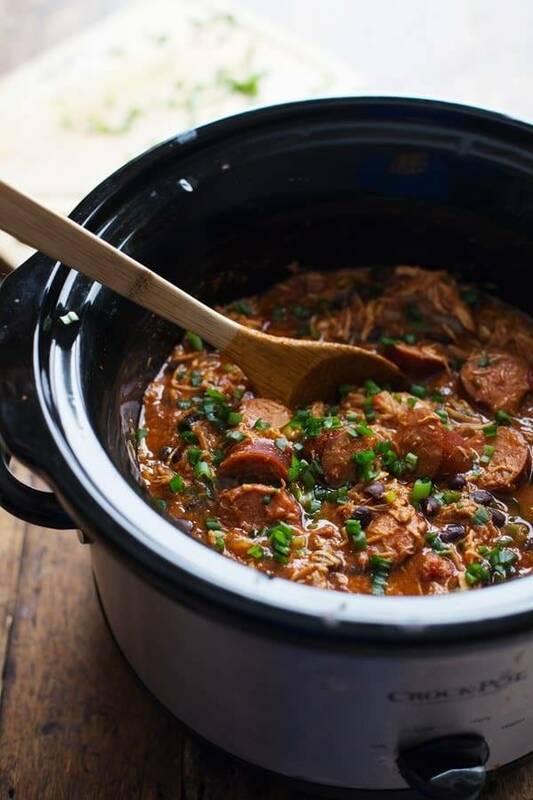 I prepared this last night and popped it in the slow cooker this morning. After smelling the flavor combinations going on, I longed to get home to taste it all day! It is so delicious! I used an African sausage that we tried at a local store this weekend. So good. The shredded chicken and sausage combo is one I never would have thought to make on my own. I also made my own creole seasoning because I didn’t have any. I used smoked paprika in it, which I think added to the awesomeness. I did add the brown sugar and almond butter, tasting between each addition. Kept getting better. Thanks so much for the unique addition to my recipe file!! Made this last week and loved it! I didn’t have almond butter so just used peanut butter and it was great. I liked that it reheated really well too. Thanks for sharing! Good to know about that substitution, Patricia! Thanks! This recipe is AMAZING! I’m obsessed. 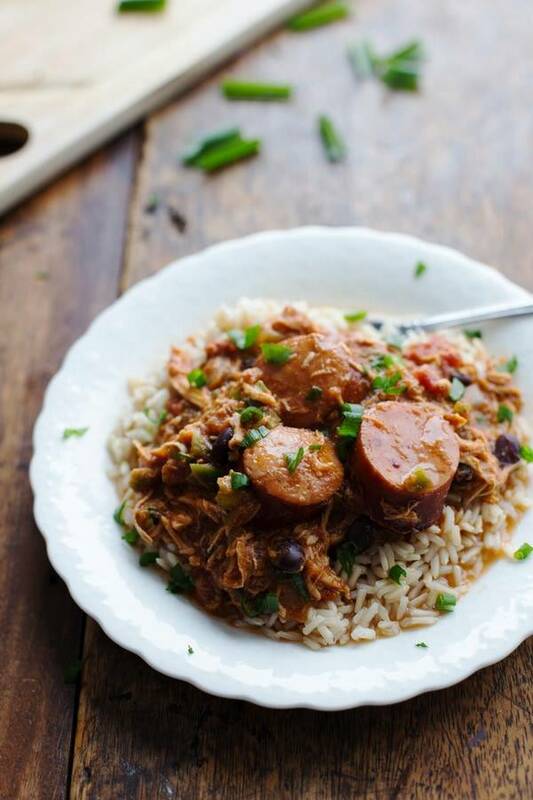 I substituted chicken thighs and used a lean italian turkey sausage, but still used tons of creole seasoning to amp up the heat. I also used a big can of black beans, corn, and 3 bell peppers to increase the fibre. Sounds delicious, Lindsay! Thanks for sharing! Just made this in the slow cooker, omitted the tomato sauce but added extra diced tomatoes and tomato paste. This recipe is super delicious and so easy! Thanks!!! We love to hear that, Charissa! Thanks for the comment! Hi I have a question about the chicken…is it supposed to be cooked and shredded before adding to the crock pot? It’s in the essentials section, which the recipe says to put all the essentials in first…but then on the second direction it says to shred the chicken into the crock pot directly. Thanks! 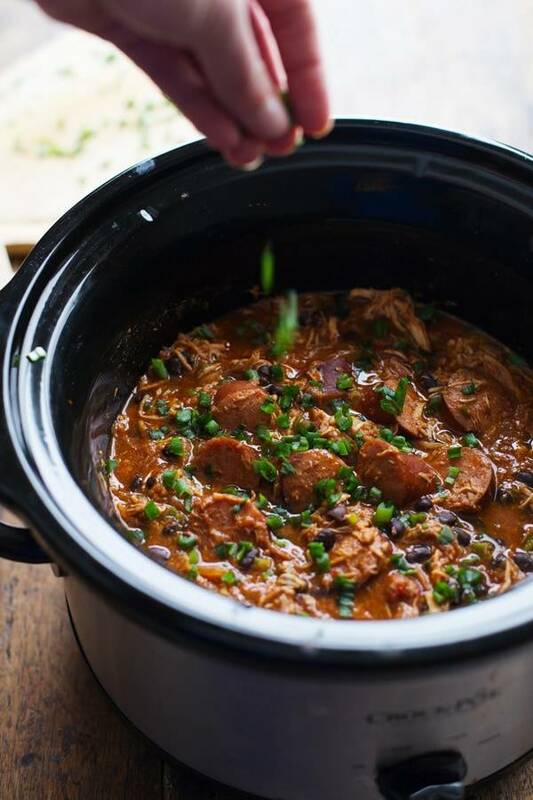 We cook ours in the crockpot then pulled out after the 6-8hrs on low cook time. Shred up the chicken, then add back in the pot with some extras for another 20ish minutes. We’ve tried 3 or 4 times with yummy success every time. Glad to hear that, Mike! Making this for dinner tonight! It will be perfect with football 🙂 Have I mentioned yet how much I love your blog? This recipe looks terrific. It’s cooking right now as we speak. Quick question. I have a pressure cooker, and it has made me inpatient. Has anyone tried this recipe in a pressure cooker, and if so what cooking time did you use? One word sums up this dish….delicious. I made it last night for supper and I couldn’t believe how amazing it was. I find most things cooked in a slow cooker tastes the same. But not this. I added more cayenne pepper because we like spicy food, but other than that I wouldn’t change a thing. A must try!!! I made this last night. It is now a family favorite I will make at least once a week. Thank you posting this recipe. I am going to go through more today and tomorrow to find more delicious recipes to make for my family. I used more cayenne pepper because I didn’t use the Andouille sausage. I am not eating anything with Sodium Nitrates in it. So I used Oscar Mayer Selects Harwood Smoked Uncured Beef Sausage. Our family is all about eating as clean as possible. Again thank you and we Love Love Love this meal. I made this tonight! Dad brought home some sausage from the local chophouse so perfect timing. Few changes: I used a can of diced tomatoes with chilis and red beans. Also I did not have creole seasoning so I made my own with black pepper, red pepper, a little thyme, paprika, and dried onions and garlic. Super tasty, thanks! Brown basmati went with it perfectly. This turned out great! So easy. I was a little worried about how liquidy it seemed when I took the chicken out to shred, but the shredded chicken, black beans and bell pepper filled it out perfectly. Next time I make this, I think I’ll end up cooking the sausage stovetop because it’s SO much better browned up. Want to make this today. In the essential ingredients what kind of “chopped onions”do you mean? Hi, Carter! We used regular white onions. i made it over the weekend & added two peeled and diced sweet potatoes for the last hour or so… YUMMMM. I was lucky enough to stumble upon this recipe through a link posted in a BuzzFeed article. And I am thanking my lucky stars! 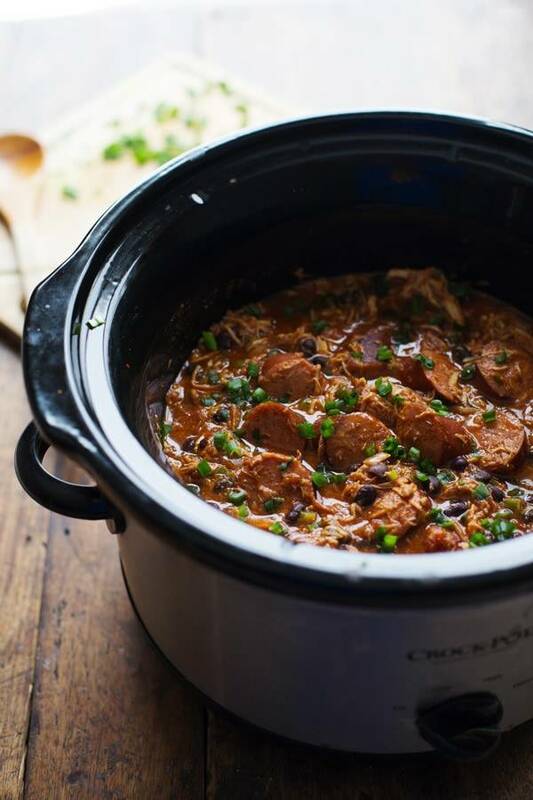 I just started using a crock pot a couple of weeks ago and have been searching for a delicious recipe. Seems the ones I tried looked better in the photos than they actually tasted. Your recipe is LEGIT. My wife and I had FOURTHS — yes I said it! I plan on trying out other recipes that I’ve found on this blog! Oh my word! I’m an emt and use my crock pot on my 48hr shifts. I made this today & it is fantastic! Thank you for sharing! Made this dish today. Absolute delish!! Will definitely be making this again! Glad to hear it, Nikii! I have tried many recipes on this website, and loved them, but this one did not really work for me. Looking forward to trying this recipe this week. Until recently I’d never cooked in a slow cooker before. Why didnt someone tell me this could be so easy and so awesome?